Summertime in the U.S. usually means going to theme parts, eating greasy foods and riding stomach churning rides like a roller coaster. In 2013, it also means that you have a smartphone with a great camera that can record all of the action. 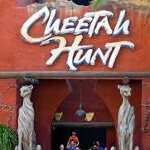 One Nokia Lumia 920 owner used the video capture on his phone to record a ride on the Cheetah Hunt at Busch Gardens in Tampa. It's a much smoother video than you would expect thanks to the OIS built into the Nokia Lumia 920's rear-facing camera. So sit back and imagine what it feels like to have the wind in your hair, two hot dogs, fries and cotton candy in the belly and a front-row seat on a 60MPH ride under the hot Florida sun. And yes, we almost forgot, you have the Nokia Lumia 920 in your hand. Ah! R.I.P HEADPHONE USERS! This video taken by the Lumia 920 is exciting indeed, I wish I can ride that awesome roller coaster. By the way, Lumia rocks. I've been in that front row before! It's a great ride. ...because you commented on it. Its a phone that is filming a rollercoaster, this happens everyday but when its a lumia combined with a camera PA feel that it needs to be posted.......Probably because there is nothing else about a lumia to post about lol!! I have tried this with my s4 and I can film my face whilst doing so....awesome! Indeed, it's not really news. But if you bring any other phone, take the same video and the output is as smooth as this, THAT would be news. wow, the OIS in the lumia 920 is pretty much working indeed and one thought that it was a gimmick.....I never saw a such smooth video for such a bumpy ride before.....i really hope nokia implements OIS in all its upcoming phones and bring other awesome technology... i am switching to lumia,that's for sure !!!! This is kinda useless without a comparison.